WHAT ARE THREATENED AND ENDANGERED SPECIES? An "endangered" species is one that is in danger of extinction throughout all or a significant portion of its range. A "threatened" species is one that is likely to become endangered in the foreseeable future. The US Fish and Wildlife Service also maintains a list of species that are candidates or proposed for listing as threatened or endangered. In California, the state has designated two additional categories: rare species, and species of special concern. Collectively, endangered, threatened, rare, special concern species are referred to as special status species. Special status species may be animals (including birds, fish, and insects), or plants. Today there are 50 species of plants and animals (26 animal and 22 plant species) that occur in or near San Francisco Bay wetlands that are listed as threatened of endangered under the state and federal endangered species act. In addition to state and federally listed species, the Bay Area is home to 16 fish and wildlife species and 13 plant species associated with wetlands that are candidate or proposed candidate species for federal endangered or threatened status. Definitions (both federal and State of California definitions) are provided in the glossary. There are 296 threatened and endangered species in California -- 116 animals and 180 plants. Marsh birds like the snowy egret, great egret, black crowned night heron, great blue heron and California clapper rail take advantage of nesting habitat in the San Francisco Estuary. The different types of wetlands provide habitat for different types of endangered species. 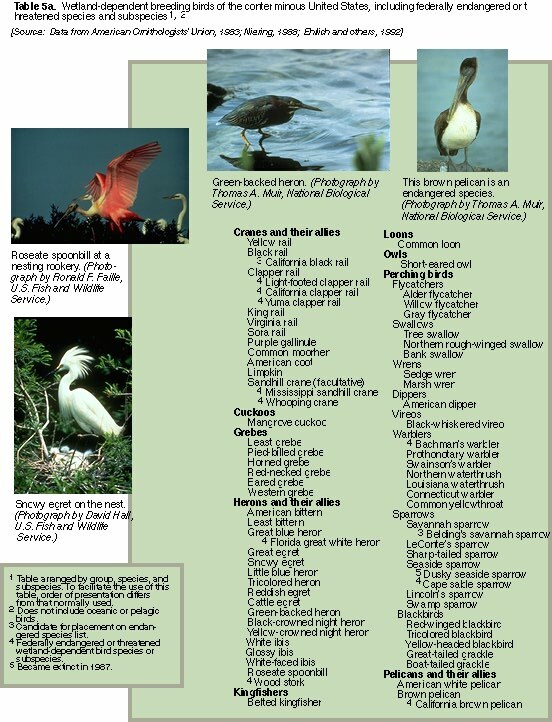 Below is a list of different wetland habitats and the special status species typically found at these habitats. For a list of threatened and endangered species for the San Francisco Bay Estuary, please refer to the Baylands Habitat Goals Report (http://www.sfei.org/sfbaygoals/) or the San Francisco Bay Joint Venture Restoring the Estuary Report (http://www.sfbayjv.org/estuarybook.html). Shaw, Samuel P. and C. Gordon Fredine 1956. Wetlands of the United States - their extent and their value to waterfowl and other wildlife. U.S. Department of the Interior, Washington, D.C. Circular 39. Northern Prairie Wildlife Research Center Home Page.